In my never-ending quest to find the best vodkas of the world, I’ve gone from Sweden (Svedka) to Denmark (Fris), and now the latest: Finlandia from Finland. Finlandia vodka is the most unique, surprising Vodka to me of this trio tasting test from Northern Europe. Finlandia has a very bright, dry taste that I might even describe as sparkling and somewhat carbonated . The Finlandia probably packs the biggest bite of the bunch, but that’s not necessarily a bad thing. The bite and harshness of Finlandia is felt at the top of the mouth and tongue, unlike a cheap vodka that burns at the back of the throat and reminds you as it goes down. When I poured my first shot of warm Finlandia into a glass and took a sip, its quick bite on the tongue and mouth prepared me for a less than smooth finish, but I was wrong. The bite the Finlandia leaves on the roof of the mouth and tongue does not translate to a less than smooth or unpleasant finish. In fact, it leaves a pleasantly clean sparkling taste in your mouth as it goes down your throat quite smoothly, leaving no burning or unpleasant after effects at all. I really enjoyed my first martini made with Finlandia, and after learning what to expect from it, my 2nd one was even better. Is Finlandia Vodka among the Best? Like Fris, Finlandia Vodka is not distilled from potato. It is made with Barley and distilled and filtered from the natural glacier waters of its own region. The makers of Finlandia say that you cannot improve upon nature, so rather than re-filtering it several times, their Finlandia Vodka only needs to be filtered once through the clear, pristine glacier waters of the region. Some reviewers have described a white-pepper taste to Finlandia and I cannot disagree with that at all. Finlandia delivers a very peppery taste and snappy finish. I paid $19.99 for a 1.75 liter at my local, discount store. You can take these Best Vodkas Ratings with a grain of salt or the 6-row barley used to make Finlandia. If it’s overall smoothness you’re after, these ratings are exactly right in my opinion. However, if you’re wanting something different, lively and interesting, you might prefer these vodka ratings in reverse. The Finlandia is the least smooth, but the most interesting. The Svedka, by far, is the smoothest of the bunch and the Fris falls somewhere in between. Finlandia vodka makes an excellent straight martini with two olives and in my opinion belongs among the Best Vodkas of the world. 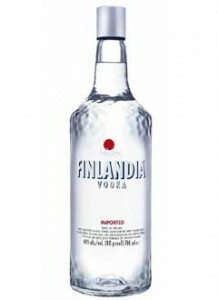 For the low price of $19.99, you won’t be disappointed in the bright, sparkling taste and smooth finish of Finlandia. I’ve often criticized using expensive vodkas to mix with fruit drinks because the strong flavors of the fruit will overwhelm and negate the pure freshness of the alcohol. However, if you insist on mixing a good vodka with fruit flavors and such, Finlandia is an an excellent way to go. The sparkling, white-pepper bite will add to the liveliness of any fruit or soft drink. I think foo-foo and martini drinkers alike, will agree that Finlandia deserves consideration among the best vodkas of the world. How do you rate Finlandia Vodka?